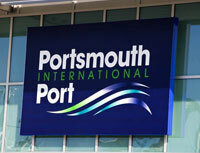 Change is in the air at Portsmouth International Port, with huge signs bearing the new name and logo of the Port hoisted high above the two entrances of its new terminal. The new terminal is designed to enhance the hassle-free experience of the 2.15 million ferry passengers who use Britain's best-connected Port every year. It is part of a £16.5 million investment in new and improved passenger facilities at the Port. With only a few weeks to go until the Port opens to passengers, the striking new addition to Portsmouth's landscape is coming to life. As builders' hoardings come down, the stunning sleek glass-and-metal construction is clear for all to see. Martin Putman, Port Manager, says, "We are delighted to see the new signs in place. It's now obvious to everyone who drives past and uses the Port that this important phase of our transformation is nearly complete. The new passenger terminal will be the best in Britain and we can't wait to open the doors to the public." Portsmouth International Port - the new name for the former "Continental Ferry Port" - has an identity that fits with its changing status. More cruise customers will use the Port this year than ever before and it is playing a bigger role in the global cargo market. The signs are clearly visible from the M275 and the Trafalgar Link Road. Backlit at night, passengers will be in no doubt they have arrived at a modern and welcoming terminal. At the passenger entrance three huge ships' anchors have been put into place. Each weighs four tons and they make a fitting and impressive addition to the landscaping of the new terminal. Inside the terminal, the hard work continues to complete the high quality interior. During the next few weeks a new Costa Coffee and a restaurant with wonderful views of the harbour will be put into place, alongside the ferry company ticket desks, shop and bureau de change. The new terminal is due to open before Easter. All services will be switched from the old terminal in a carefully planned overnight operation.